Kurumi's heart was broken by the sudden death of her boyfriend in a tragic airplane accident. Forced to carry on without her beloved Hal, she fell into a reclusive and joyless existence. Kurumi had given up on the world, but a brilliant scientist devised a plan to win her back. By melding futuristic technology with the binary equivalent of human emotion, they created an ultra-lifelike robotic surrogate to take Hal's place—and lure Kurumi from her shroud of solitude. Resistant at first, this shattered beauty slowly yielded to her feelings of longing—and took comfort in the company of a robot. Though their unique bond grew stronger with each passing day, Kurumi and Hal would soon discover that nothing about their artificial love story was quite as it seemed. 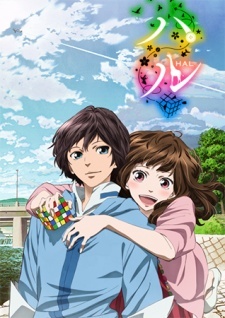 Watch Hal Episodes Online at Animegg.org. Hal is available in High Definition only through Animegg.org. Choose an episode below and start watching Hal in Subbed & Dubbed HD now.